Since everyone loved the first Quinoa Granola recipe so much (my real family and blog family) I decided to make more with a different flavor. This one came out barely sweet with a hint of vanilla. It’s perfect for topping yogurt or fruit with, but good enough to eat straight out of the jar. You can taste the protein powder in this version a little more because I added more, so if that isn’t your thing I’d recommend scaling down a bit. This one got rave reviews just like the last one though so I think it’s really good as is. If your worried about using uncooked quinoa, don’t be! It gets slightly toasted in the oven and adds the best toasty flavor and crunch to this granola. 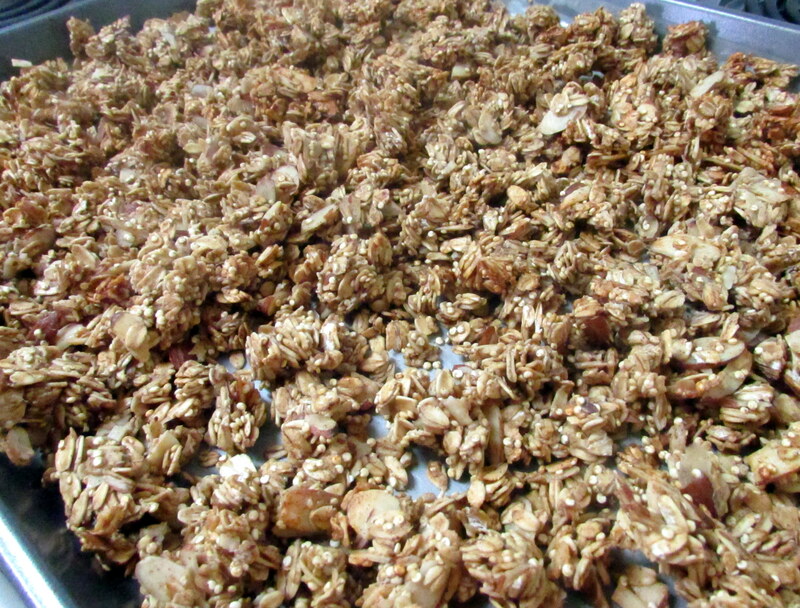 I love when granola clumps like this into clusters, mostly so that I can pick up the clusters and eat them as is. 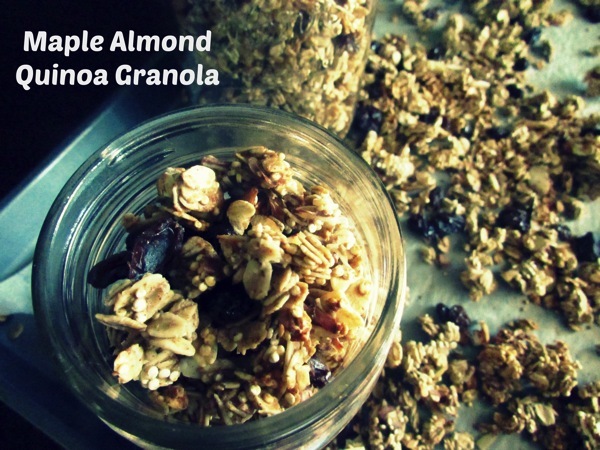 I am definitely guilty of eating this granola straight out of the jar almost every night. 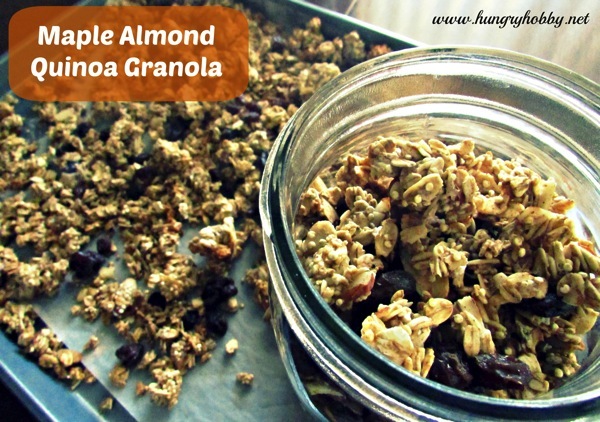 Thats okay though because unlike store bought granola this homemade version is higher in protein and lower in added sugar and fat. Recently, I’ve fallen in love with making the quinoa version of granola because it’s so incredibly easy to make. 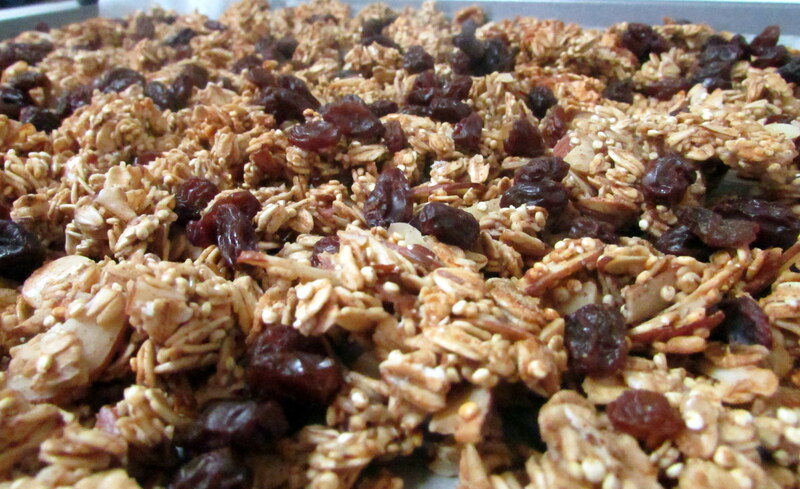 Granola can be made on the stovetop or baked in the oven but some recipes require an hour cooking time or more. This version is made in under 30 minutes and yields a toasty crunchy product that is better than any box you could buy at the store. 5T Walden Farms Pancake Syrup or use more real syrup, agave, honey etc. Spread out evenly across baking sheet. Bake for 20-25 minutes turning half way through. It will be done when slightly golden brown, but it won’t get crunchy till completely cool. Once cool add desired dried fruit and store in air tight container. That’s it folks, then you have an addicting and secretly healthy granola at your disposal whenever you wish! Have a great Tuesday and let me know if you try it! *Note this post was amended with pictures that failed to upload the first time.